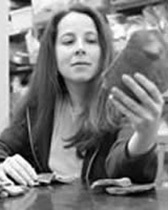 Cynthia Robin is an anthropological archaeologist who specializes in the study of the everyday lives of ordinary people in ancient Maya society. Her research has paid particular attention to household and gender relations. By documenting archaeologically how ordinary people make a difference in the past, we become aware that people are not the mere pawns of history or prehistory. Since 2001 Robin has led an international multi-disciplinary team that is studying the 2000 year history of the ancient Maya farming community of Chan in Belize. Chan’s occupation spans the periods of the rise and fall of pre-Columbian Maya civilization, making Chan an ideal place not only to learn about Maya farmers, but also to explore how ordinary life affected and was affected by broader changes in a society. Her research at Chan has been funded by the National Science Foundation, the National Endowment for the Humanities, the National Geographic Society, the John J. Heinz III Charitable Trust, and Northwestern University. Find more information on the Chan Project. Robin’s previous publications include “Gender, Farming, and Long-Term Change: Maya Historical and Archaeological Perspectives” (Current Anthropology), “New Directions in Classic Maya Household Archaeology” (Journal of Archaeological Research) ,“Outside of Houses: The Practices of Everyday Life at Chan Nòohol, Belize” (Journal of Social Archaeology), “Peopling the Past: New Perspectives on the Ancient Maya” (Proceedings of the National Academy of Sciences), Gender, Households, and Society: Unraveling the Threads of the Past and the Present (Archaeological Papers of the American Anthropological Association), Spatial Theory and Archaeological Ethnographies, a special section in the Journal of Social Archaeology and the book Preclassic Maya Burials at Cuello, Belize (British Archaeological Reports). 2002 Spatial Theory and Archaeological Ethnographies, special section of Journal of Social Archaeology 2(2). 1989 Preclassic Maya Burials at Cuello, Belize, British Archaeological Reports International Series 480, Oxford.